The Plus in the name is no longer just an indication for a bigger screen. The vanilla Moto G7 is carrying the same 6.2-inch IPS LCD screen, so the Plus here stands for added features and functions that other Motos don't have. Anyway, the panel offers a 1080 x 2270 pixels (FHD+) resolution making for a tall 19:9 aspect ratio. The notch is a bit longer than we expected making the status bar taller as well. In any case, the display went through our usual tests and the results are a mixed bag. The maximum recorded brightness is 473 nits, which is good for comfortable outdoor use while the 1425:1 contrast ratio ensures deep blacks. At least for a mid-range IPS display that is. Setting the display on Adaptive Brightness will trigger the Max Auto mode when needed and boost the maximum brightness to 573 nits for a short period of time although, it will need some cool off time before it kicks in again. Unfortunately, color reproduction is where the Moto G7 Plus falls short. The system provides three color presets - natural, boosted and saturated with the latter being the default setting out of the box. None of the presets offered any significant change to the dE2000. Surprisingly, the boosted mode had the lowest average dE2000 of 5.6 while the saturated preset returned an average dE2000 of 6.2. The blue-ish whites can be observed in all settings, so this is something you have to keep in mind. Overall, the display quality compared to the Moto G6 Plus is definitely a step back. Last year, we were impressed with the color reproduction and the maximum brightness. It was one of the standout features of the handset whereas this year, the Moto G7 Plus just settles for "average". Despite the rather high maximum brightness, the reflectiveness of the outer layer of the panel keeps the sunlight legibility score a bit lower than we would like to. Still, it's enough for a comfortable outdoor use. Battery life is pretty underwhelming and we expected more from the 3,000 mAh battery and the rather efficient Snapdragon 636 SoC. Perhaps the big 6.2-inch screen took a toll on the battery, then again, the standby and the talk time tests weren't impressive either. Our overall endurance rating is just 59h and it's lower than last year's Moto G6 Plus. Fun fact - it's actually a tad better than the original Moto G from 2013 but that's of little consolation. Our battery tests were automated thanks to SmartViser, using its viSer App. 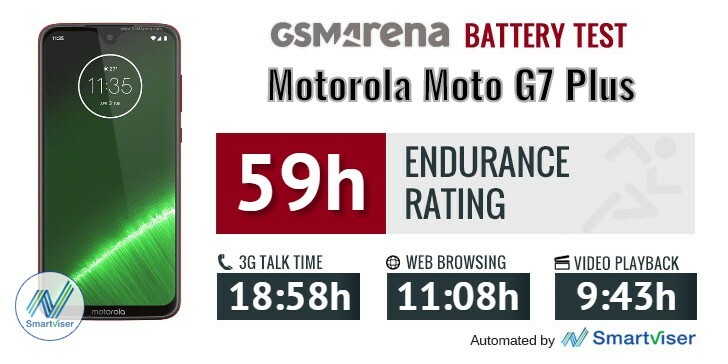 The endurance rating above denotes how long a single battery charge will last you if you use the Motorola Moto G7 Plus for an hour each of telephony, web browsing, and video playback daily. We've established this usage pattern so that our battery results are comparable across devices in the most common day-to-day tasks. The battery testing procedure is described in detail in case you're interested in the nitty-gritty. You can check out our complete battery test table, where you can see how all of the smartphones we've tested will compare under your own typical use. The fast 27W TurboPower charging will surely come in handy here as it fills up the battery from 0 to 79% in just 30 minutes, which is super fast. That's downright impressive and could potentially change your charging habits for the better - no more overnighting. You do have to carry the included charger with you if you start relying on quick top-offs, though. Our testing reveals that unlike other Moto phones, the TurboPower charging here is actually utilizing the USB Power Delivery protocol and it reaches the advertised 27W power output. The loudspeakers' loudness is right up there with the best and we've tested them in all Dolby Audio modes available - Smart audio, Music, and Movie. The movie preset was the loudest one while the music preset was the quietest. Sound quality is pretty good as well - the bottom-firing speaker does sound a bit fuller than the other one but that's to be expected. Regardless, we can confidently say it's one of the better stereo loudspeaker implementations. 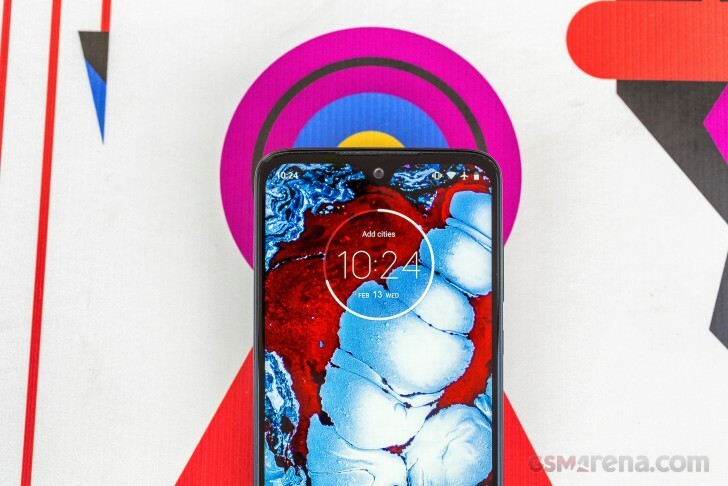 The Motorola Moto G7 Plus had impressively high volume with an active external amplifier and excellent scores across the board, making it a great driver for your home stereo or car audio. Loudness remained very high even with headphones - a particularly impressive achievement given the relatively low standing of the smartphone. What’s more the clarity was barely affected either - a minor hike in stereo crosstalk is all there is to it. A really great showing by the Moto G7 Plus here!